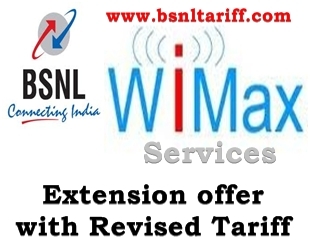 Telecom Backbone Bharat Sanchar Nigam Limited (BSNL) has announced Extension of promotional offer under WiMax Services across Kerala Telecom Circle for a period of 90 days. The Competent Authority of Kerala Telecom Circle has decided to extend the Promotional offer of Wimax Plans Rs.220/- (Promo usage discount above 400 MB), WiMax plan Rs.350/- (Promo usage discount above 1GB) and Wimax plan Rs.750/- (Promo usage discount above 4GB) across Kerala Circle. The promo usage component is available in WiMax Kerala BD Cell offers. The above offer will be implemented and with effect from 25-06-2013 to 22-09-2013, for 90 days.